I grew up in Canada where the differing levels of hockey were all pretty clear cut, from coast-to-coast. Now living in the United States with children playing hockey, I've been pretty much, well, totally lost once terms like select, elite, premier, AAA, national, and tier enter the conversation. USA Hockey's tentacles have invaded youth hockey but, for whatever reason, they've failed to reel all of these ambiguous adjectives in. So, I'm going to try my best to break it down. The first part of making sense of it all is establishing that youth hockey and junior hockey are NOT the same which, initially, is a little confusing for folks living outside of Canada (where they actually call youth hockey minor hockey instead). First off, the Tier designations in junior hockey and youth hockey are completely different and totally unrelated. In the United States, there are 3 "Tiers" of Junior hockey. Tier 1 is the top level and, as of right now, the USHL is the ONLY Tier 1 Junior hockey league. Though, in my opinion, the talent level isn't the "best of the best", it is the American equivalent to Canadian Major Juniors -- the WHL, OHL, and QMJHL. All of the teams in the league are based in the Upper Midwest and players are between the ages of 15 and 20. Players in this league retain their NCAA eligibility (which is not the case for players going the Canadian Juniors route) so it's a path most often taken for American players looking to play Division 1 College hockey...as 20+ year old freshman. Confusedly, regarding the NCAA eligibility, playing in the USHL is free for the players. They don't get paid...but they're not paying anything to play. Hooray for tuition free hockey, right? Tier 2 is the second rung down. Again, there is only one league, the NAHL, that USA Hockey recognizes as Tier 2. The NAHL, however, classifies itself as an "alternative" to the USHL. Many of its teams are also in the Upper Midwest but they've also, wisely, branched out and have teams farther south in Texas and Louisiana as well as in the east in Pennsylvania, New Jersey, and Massachusetts, and even two teams out in Alaska. Players in the NAHL also get to play for free...BUT have to pay billet fees and other living expenses out of pocket...sort of. The teams generally pay stipends to the billet families to make it more affordable but, really, this is just a back-room deal going on to allow the players in the league to retain their NCAA eligibility. In Canadian Juniors, hey, at least they're honest and giving the stipend directly to the players. Talent wise, I think Tier 2 is right up there -- it's a direct path to play Division 1 college hockey, if that's the goal. Down another rung is Tier 3 and, I know, being the third level down makes it sound like crap hockey...but it's not. The big difference is that Tier 3 is what we're all so used to -- pay-to-play. Tier 3 teams are coast-to-coast and the leagues change names just as often as the names of the teams do. Total wild west where some have "affiliations" with other teams across the country and terms like futures, elite, and premier are tossed about interchangeably...and the talent levels vary widely. Team owners group up and form closed leagues and give off the image that they're the "top" league -- the USPHL even applied to become a Tier 2 league (and failed) -- and refuse to compete against any outsiders that could challenge their "top league" claims. Really, it's a lot of marketing. You know a good team when you see one. Realistically, though, I'd bet money that in the next few years, the line between Tier 2 and Tier 3 will be blurred greatly...or perhaps a lot more teams will just be joining the NAHL as it expands coast to coast. Teams in Tier 3 are also age specific. There aren't 16 year olds and 20 year olds on the same team -- it really is more like a continuation of youth hockey. Unexplainably... USA Hockey classifies the Tier 3 Junior programs for the players under 18 as Tier 1 youth teams. All of that said, strong Tier 3 teams could smoke NAHL or USHL teams on any given night -- the talent is there. Of course, just like how it is in youth hockey, the top Tier teams will never allow any sort of game like that to ever occur. As with a lot of things in life, sometimes it's talent that takes you places and sometimes it's just the people you know. So, here it is in a nutshell. If your son is super, super, super talented when they're 14, 15, or 16 years old, there's a chance they'll be recruited by a Tier 1 or Tier 2 team and start playing with 20 year olds immediately...and that gives them a semi-decent shot at playing at a Division 1 school on a scholarship. If you son hasn't yet peaked at that young of an age, they'll play in a Tier 3 league (as a Tier 1 youth player) with kids their own age. While this significantly lowers they're chances of playing Division 1 College hockey, it's still top end hockey that can take you to a Division 3 College. The Canadian Juniors also scout the crap out of this level and you could end up there as well -- a more "direct" path to professional hockey, if that's the goal. And overlapping all of this is prep school hockey. Yeah, I know...it's overwhelming. In the end, if US college hockey is the goal, regardless of which of these paths you take, you'll be a 20-something year old freshman with a very small chance of playing professional hockey...cause you'll be far past "prospect" age by the time you finish your degree. Getting a "real" job would probably be most beneficial at that point. Just something to keep in mind. Okay, all of that aside, now it's time to try to get a grasp on youth hockey. My oldest is only a squirt...but we've already waded through more bullsh!t claims than I'd ever imagined. He plays for a Tier 1 AAA team in the Premier division of a league that's widely considered a second level league. Tier 1. AAA. Premier, which I might add is higher than elite (in this league, anyway), but in a lower league. This is exactly the crap that USA Hockey needs to eliminate...because all of it is still under their umbrella and you'd think they'd be able to enact something...but there are a lot of egos that would need to be stroked. 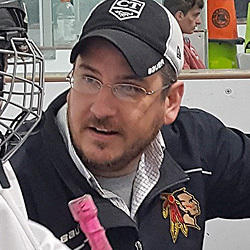 In our neck of the woods, in Massachusetts, New Hampshire, Connecticut, and Rhode Island, at the youth hockey level, there's a great example. Fact is, though, both leagues are super strong at the top. Side note -- both leagues view the AYHL with teams mostly from NY, NJ, CT, and PA as being a far lower skill level...but teams in that league can certainly hold their own with the top ranked FED teams. It's all perception. Using the FED further, as an example, they have an Elite level and a Tier 1 level. The "Elite" level is the top rung (in that league). What they call "Tier 1" -- which they used to call "AAA" -- is more akin to a high level rec or town league hockey...but marketed as something much greater. In the Midwest, which produces far more NHL prospects than New England, a AAA designation is the top rung. So, even with all of that said, there are a lot of teams that throw around the Tier 1 language...less than honestly. Or maybe they are honest? It's...complicated and, frankly, there is no standardization when it comes you youth hockey tiers. None. Every hockey program in the FED places their top team at each birth year in the "Elite" league -- regardless of how talented they are. Direct from mouth of the head coach of one of the top teams in the country, regarding the FED and all similarly structured leagues, "You've got two really high end teams in each birth year, a bunch all clumped together in the middle that have the same pool of players swapping programs each season, and then a handful of teams that can't get out of their own zone." Sounds a little like the current state of the NBA, doesn't it? I'd bet there are pro basketball teams you've never even heard of from countries that you didn't even know had leagues that could take down 75% of the NBA. The "prominence" of those top teams is inflated as they often end up with league competition far below their skill level. I love that the coaches are fully aware of it. Sadly, a lot of the parents are blind to it...but that's what keeps the programs in these tight leagues thriving financially. Exclusivity has a price tag. See, perceived "top" leagues like the FED are essentially closed door, as I've said before...but there are countless youth hockey programs out there that have "Tier 1" talented teams at specific birth years but lack the depth across all birth years to bargain/buy their way into these exclusive leagues. As with a lot of things in life, and I know I said it already explaining Junior hockey but it's the same here, sometimes it's more about who you know than what you can do. There are very strong Tier 4 teams (which is generically "town-level" hockey) in our area that are shut out from being allowed to compete in leagues like the FED but still play in wider ranging Tier 1 leagues like the AYHL with great success...and are certainly talented enough to hang with anybody. Point is, until your kid is playing at the highest level of professional hockey, there will ALWAYS be a team out there that is substantially better than yours, from top to bottom, regardless of how many fancy adjectives you use to describe them. And now read the rest of this article very carefully cause it's the best, and most honest, advice you'll receive today. When seeking out a youth hockey program, don't shop based on the league they play in. Using the FED as an example again, the top team from each of their members is automatically put into the "Elite" level even though other programs "AA" or "Tier 1" programs could wipe the floor with some of them. It's one thing to try to play for the top team in one of the top leagues at your specific birth year...but just trying to crack a team in a specific league because you, as a parent, see it as the top league is not a recipe for success or development. Just try and put your player on a team with a good coach, period. Don't worry about league bullsh!t - because that's all it is. Don't worry about the team/program either. The 2006 birth year team being number one in the country has ZERO relevance on the 2008 birth year team. Very few organizations are awesome from top to bottom. If your son or daughter loves the game, a good coach makes all the difference. Pro hockey players have told me this themselves. Good coaches develop better hockey players. Better hockey players make better teams. As I've shown, there are countless leagues and teams claiming to be elite, tier 1, select, premier, or AAA. What's in short supply, universally, is good coaching...and that can be found in any league at any tier. That's what you should seek out.